ROCHESTER, MI -- Have fun and help the needy! 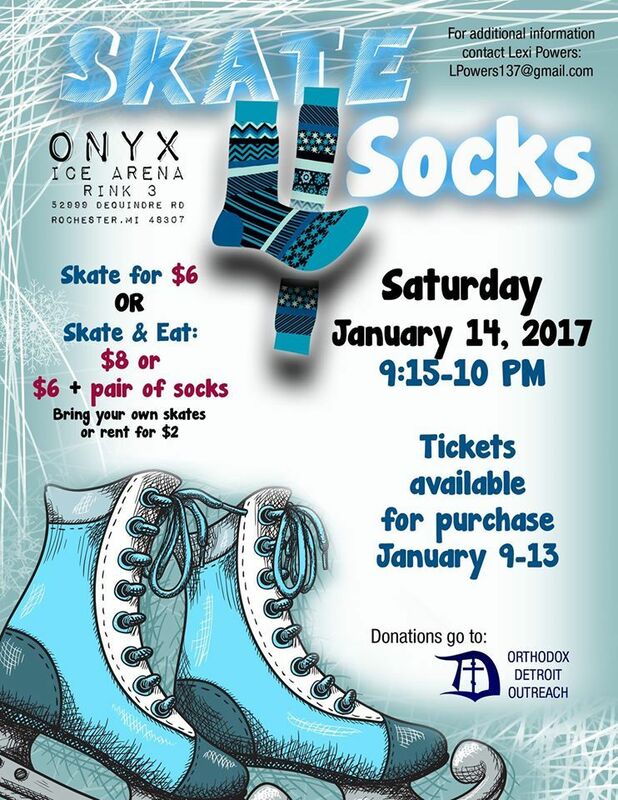 Skate 4 Socks, a fundraiser organized by local Orthodox youth to collect socks for the homeless through Orthodox Detroit Outreach (ODO), will take place on Saturday, January 14 at ONYX Skating Arena (52999 Dequindre Rd) in Rochester. The event will take place at Rink 3 from 9:15-10:00 pm. Come to skate, have pizza, enjoy fun and games...and help the homeless while you are at it. Individuals, families, friends and even parish youth groups are invited to participate. All donations will be gladly accepted and will go to aid the less fortunate. See flyer for more information, or contact Lexi Powers at LPowers137@gmail.com.